Thought we had finished our road trips for the year until an invitation came to preview "Dressing Downton: Changing Fashion for Changing Times" at the Lightner Museum in St. Augustine, Florida. 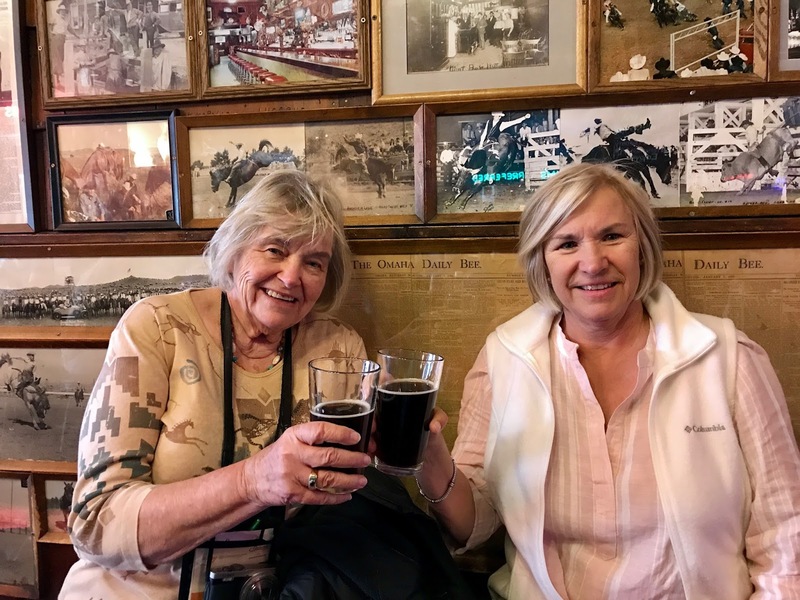 You don't have to invite the Good Girls twice so we hopped in our bucket seats, Debi heading north, Judy aiming south until we met in the nation's Oldest City. It's the last stop in the U. S. this blockbuster exhibit of authentic period costumes and accessories from the addictive PBS series Downton Abbey. 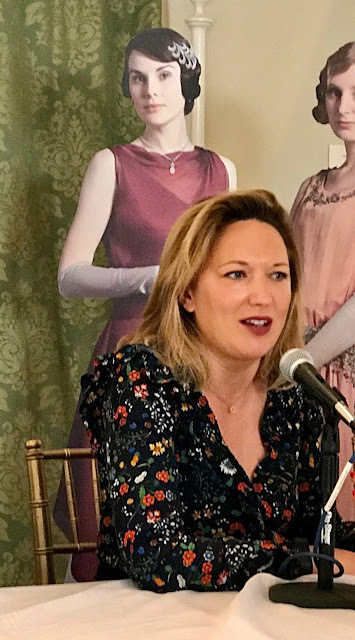 At the press conference we met Jessica Fellowes, niece of scriptwriter and Downton creator Julian Fellowes and an expert on all things Downton, and Nancy Lawson, curator of the exhibit of 36 authentic Victorian era outfits. Nancy was particularly interesting. For the first three seasons, the actors were clad in historic attire from British collections of antique garments . "These were real clothes," she said. "Very fragile; over 100 years old. By the fourth season, everything was made by the costume team. The craftsmanship will appeal to you even if you don't give a fig about the clothes." Interesting, but we wanted to see those clothes! None too soon we were ushered up to the ballroom where they were displayed and wow, the nobility not only lived well, they dressed superbly. By themselves they were worth the trip but as Lightner curator Barry Myers and his staff have displayed them, the result is spectacular. 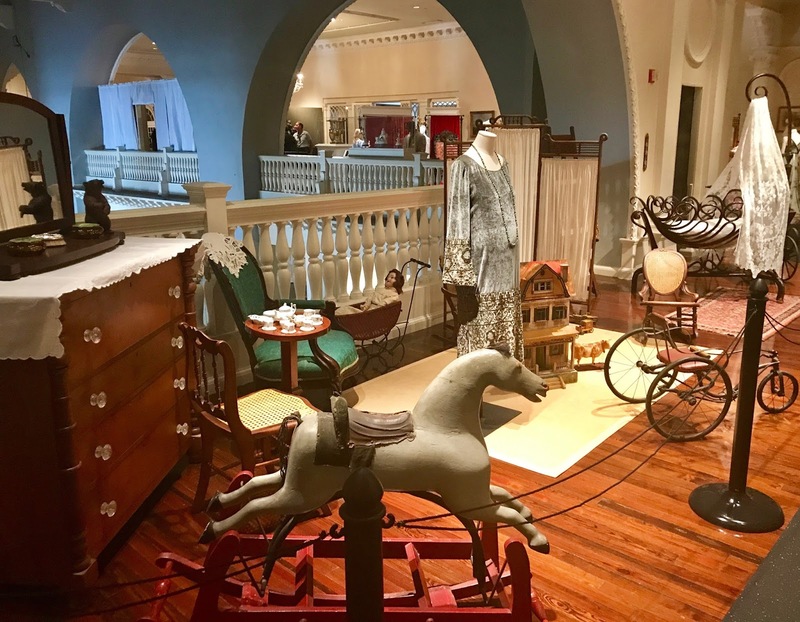 The late Otto Lightner was a collector of just about everything, from cigar bands to music boxes and the art and furnishings that surrounded them from what we've come to know as the "Gilded Age." 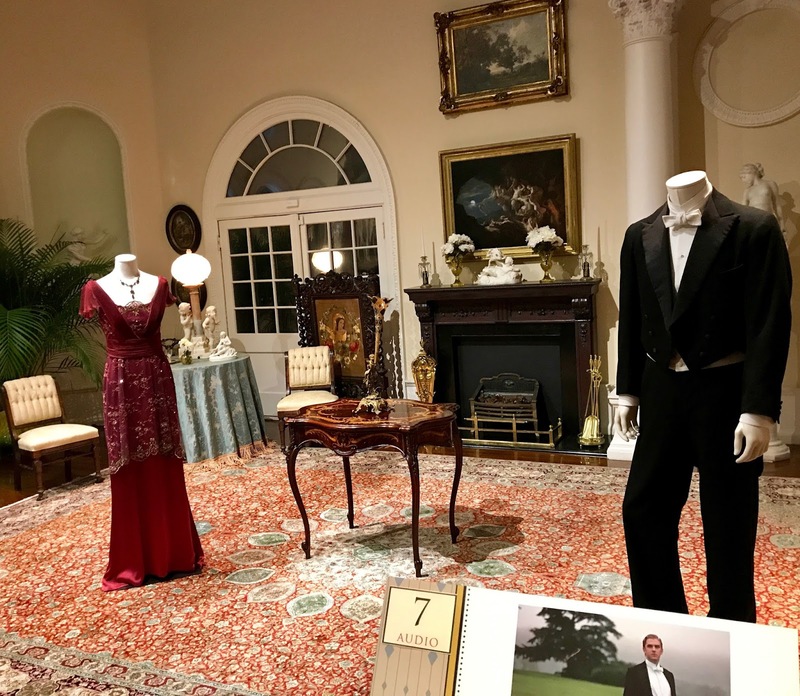 The museum's attic was scoured, appropriate period pieces were pulled out and polished then arranged into "rooms" to suit the attire. The result is a rich array, visually dense dense and satisfying as it sets off what the characters living there would have been wearing. 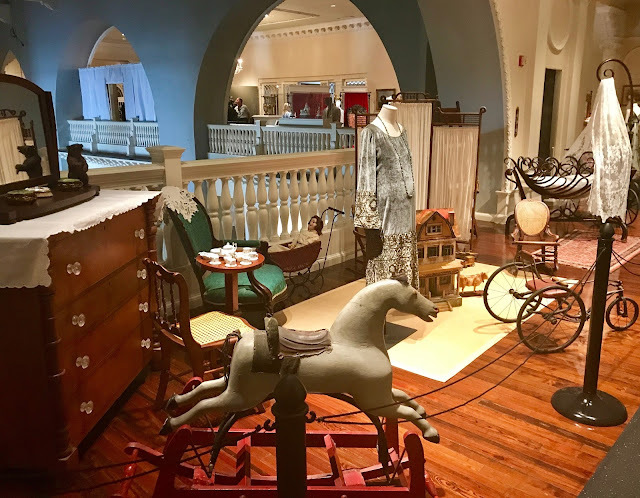 After all, the museum is the former Alcazar Hotel, built by magnate Henry Flagler in the Gilded Age to accommodate the younger set who found his elegant Ponce de Leon Hotel across the street too stuffy. 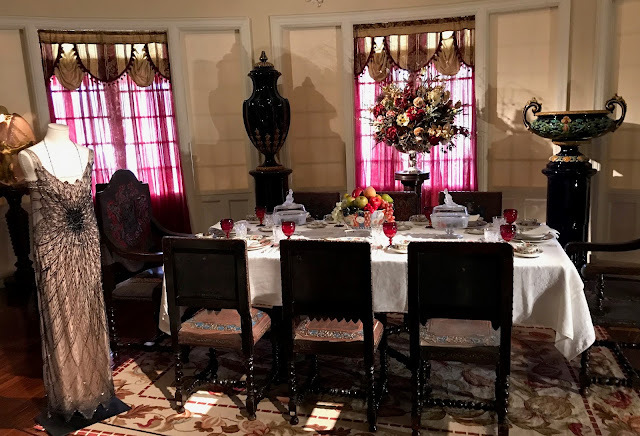 As Debi remarked, "The dining room table setting is so inviting I wanted to jump across the ropes and sit down." 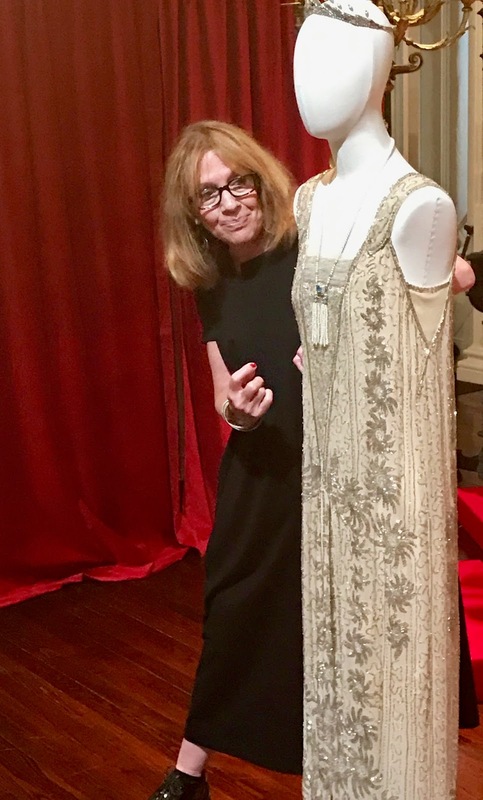 Alas, neither of us were wearing anything as elegant as the chic gown on display, one of our favorites. As we circled the tableaux, we came across curator Nancy again who summed up the experience perfectly. 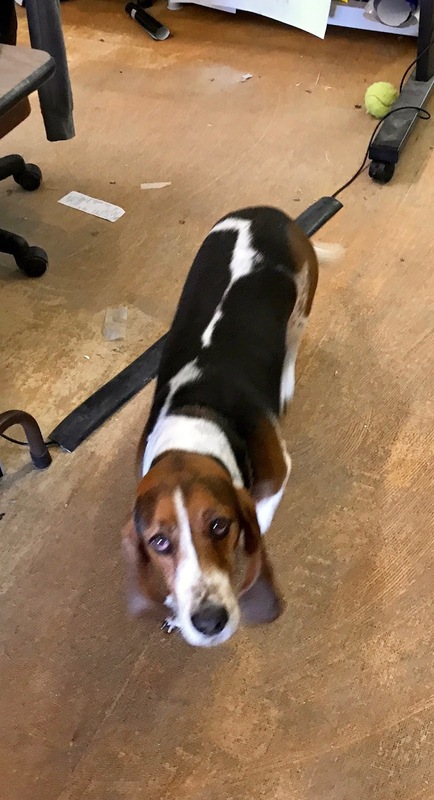 "The camera focuses on the face. Now you can see the whole ensemble." 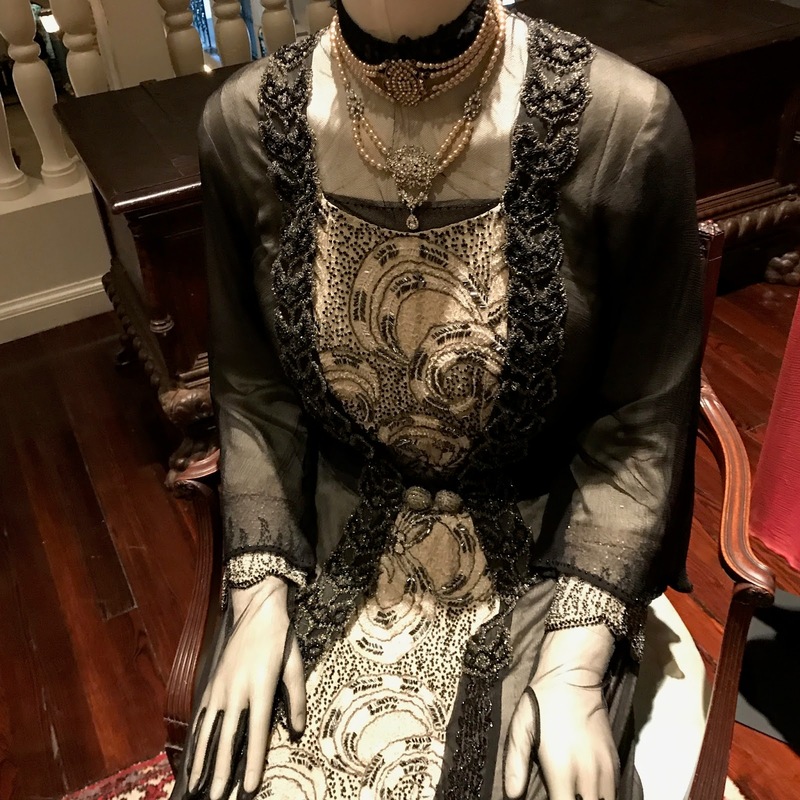 "Dressing Downton" is on display now through January 7, 2018. We strongly suggest you see it. Many special events accompany the show. High Tea at Cafe Alcazar. Set in what was the hotel's enormous indoor swimming pool, it includes sweets and savories , 3-5 p.m., Sunday through Thursday, 2-3 p.m. Friday and Saturday. For reservations contact Cafe Alcazar (lunch can be had there throughout the week), 904-825-9948 or the museum. Upstairs/Downstairs at the Alcazar. 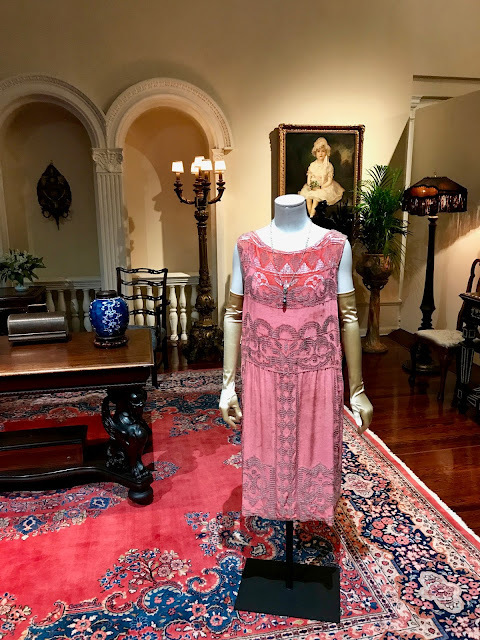 Learn what life was like for guests and staff during the Gilded Age in a one-hour tour for groups of 10 adults; $45; www.lightnermuseum.org/tours. Unless otherwise noted, contact the Museum for reservations, www.lightnerhotel.org. Nov. 4: Nicholas Dawes, "The Treasures of Downton: An Appraiser's View," 10 a.m., Casa Monica Hotel. The Antiques Roadshow appraiser and member of the Heritage Auctions team speaks on decorative items found in the great English homes of the 19th century. Nov. 4: Nicholas Dawes Appraisal Clinic,:11 a.m., Flagler Room, Flagler College. Dawes will appraise one small item for each special ticket holder. December 12-14: Dining at Highclere with Francine Segan, James Beard-nominated author and Italian cuisine expert, talks of elaborate etiquette, entertainment and the dishes Mrs. Patmore would have sent to table. Munch, Mingle and Matriculate, ay history of chocolates. American Food Fads - Gilded Age to Today. Dec. 31: New Year's Eve Soiree and Anniversary Party, Lightner Museum Historic Pool Area. 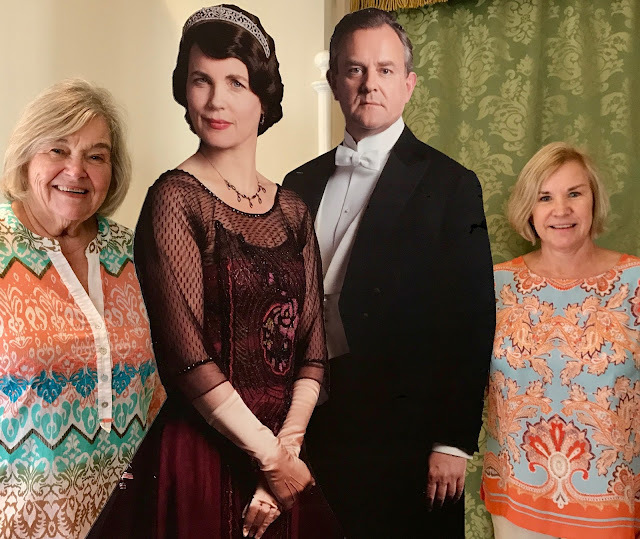 Bed and Breakfast "Dressing Downton" promotion. • Two Golden Admission tickets to the exhibition and museum at any time during the admission date. In all, a $60 value. Now through Jan. 7, 2018 excluding Dec. 26-29, 2017. Driving in the middle of nowhere for over an hour, we were starting to give up hope on our planned Close Encounters of the Steven Spielberg kind. 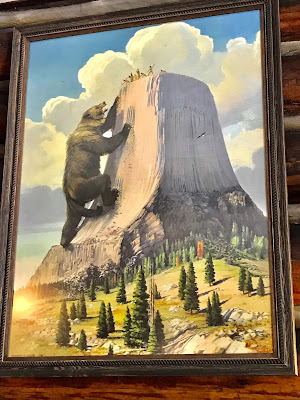 Then it emerged in the distance - - Devils Tower - - a stately tower bestride a hill. Its mesmerizing aura pulls like a powerful magnet. It’s had that effect for millennia, with the Northern Plains Indians and other indigenous people considering the Tower a sacred site. 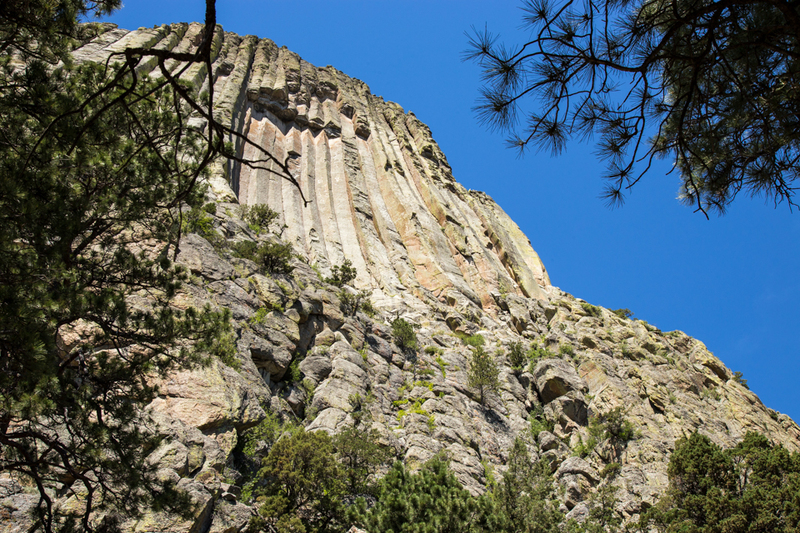 Even Congress recognized its singularity, designating the area a U.S. forest reserve in 1892 and later, in 1906, Devils Tower became the nation's first National Monument. 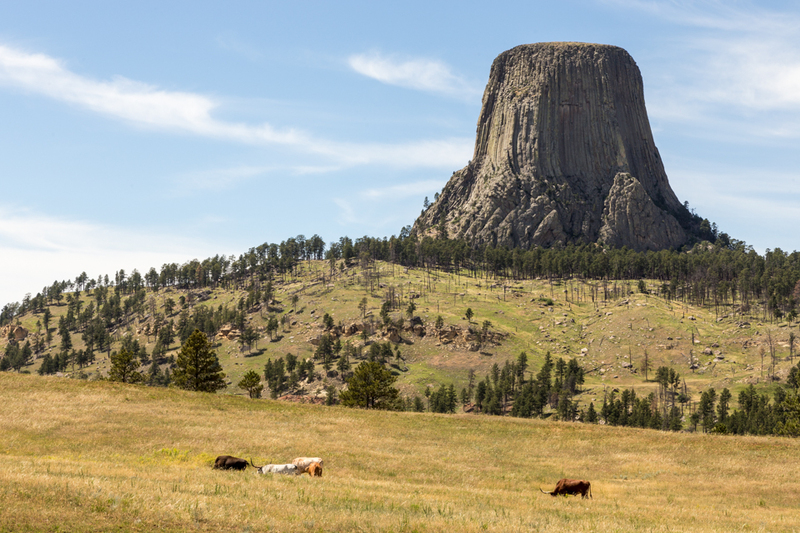 Our first look at Devils Tower in Wyoming. We couldn’t wait to get a closer look at the protruding spire. We passed onto the National Park site and took a winding road up to a parking lot. The area offers a few hiking paths, but Judy and I chose the popular Tower Trail, a paved, 1.3-mile loop around the base of the formation. The route is a smooth, flat trail, but your neck begins to get sore because you can’t resist staring up at the fascinating structure. 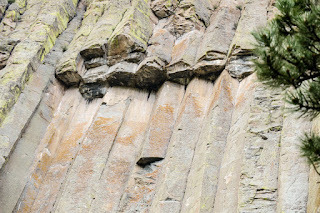 Looking up at Devils Tower. Kids climb on the rocks near the base, many take selfies, and informational signs appear as you walk the circuit. 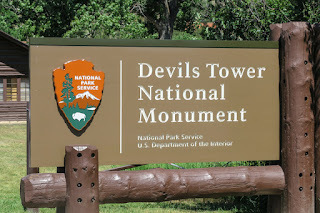 Documented claims place the naming of Devil's Tower to 1875 when an interpreter for expedition leader Colonel Richard Irving Dodge misinterpreted a native name to mean "Bad God's Tower." The apostrophe never made it through the translation. 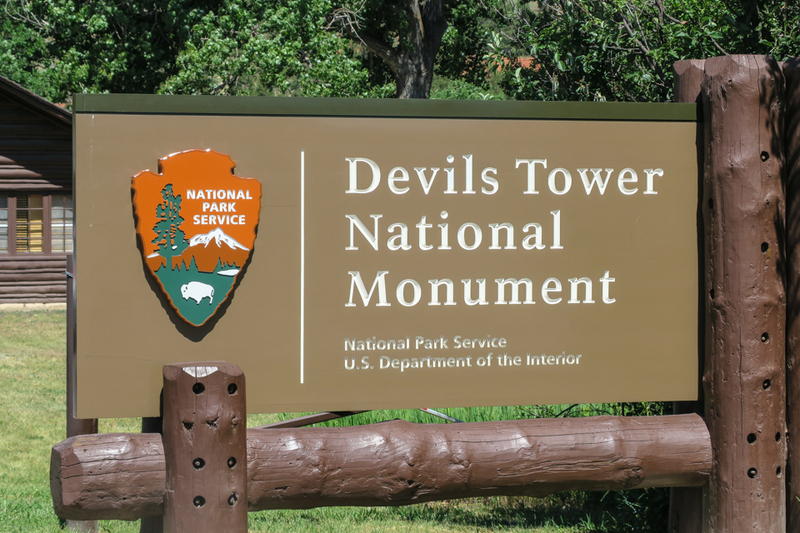 All information signs use the name "Devils Tower," following a geographic naming standard eliminating apostrophes, perhaps easing the burdens on cartographers. Native American names for the monolith include: "Bear's House" or "Bear's Lodge" "Bear's Lair. " 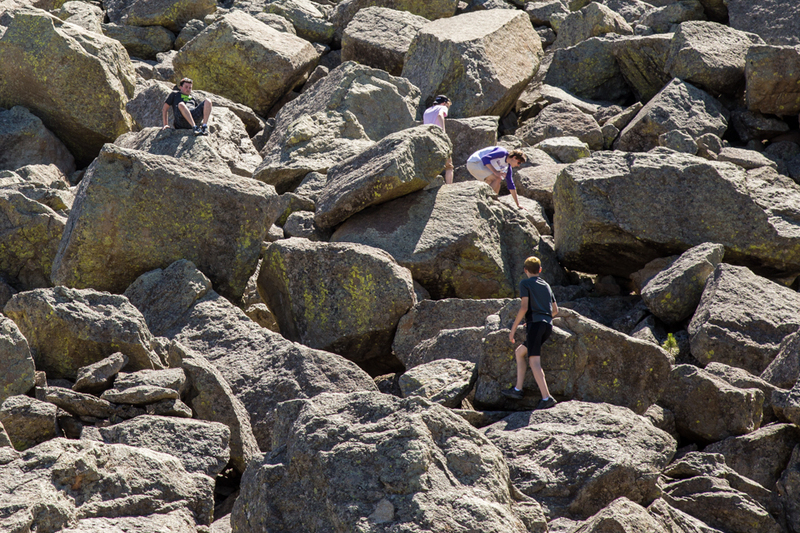 Kids climbing on the rock pile at the base of Devils Tower. Enchanting, but that story hasn’t persuaded the geologists. They offer a few differing theories but agree that a volcanic intrusion created the structure, but don’t agree on exactly how that process took place. 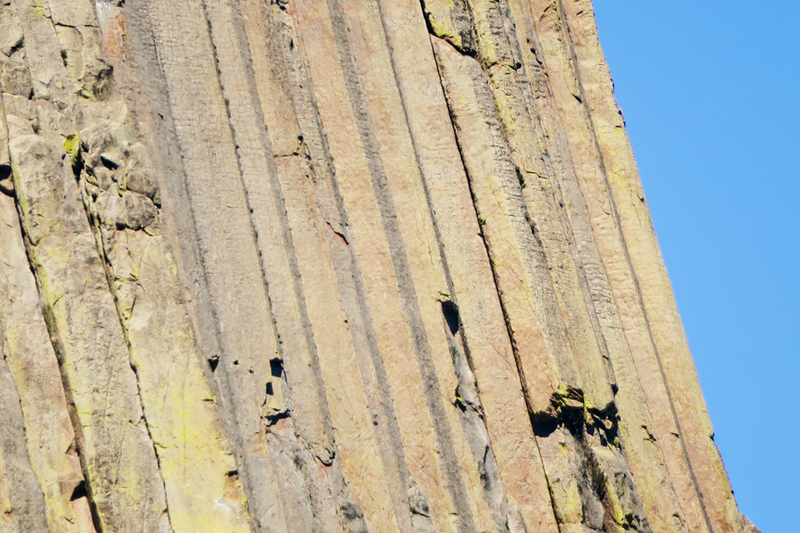 One theory states that the tower is all that remains of an ancient explosive volcano. 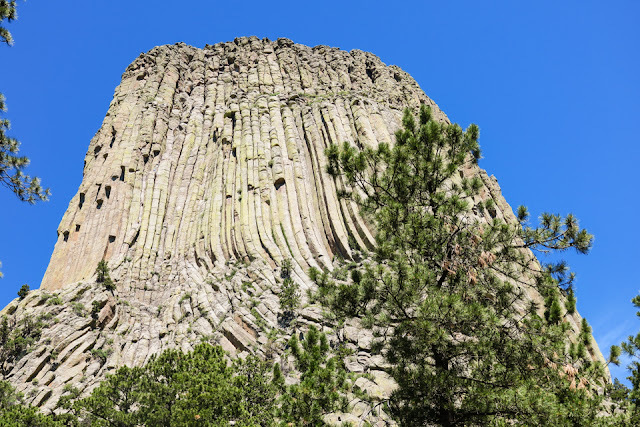 A common explanation holds that the tower was entirely underground when formed, becoming visible only as the surrounding mantle eroded over countless ages. Ridges cover the surface of Devils Tower. Other theories suggest that Devils Tower is a volcanic plug or that it is the neck of an extinct volcano. Presumably, if that were the case, the volcanic ash, lava flows, and volcanic debris would have eroded long ago. The tower today offers a well-defined rib-like structure. Look close, and you'll see the ribs as hexagonal segments uniformly shaped, like a pencil. Condensation as the tower cooled and hardened are thought to have created pressure points that produced the fracturing that generated the hexagons. It appears that entire columns of rock broke off and fell, given the piles of broken columns, boulders and smaller rocks piled at the base. These indicate that the monolith was once wider than it is today. Climbers are dwarfed by the staggering Tower. Halfway around we noticed a few climbers attempting to reach the peak. They looked like they were studying where next to place their feet and hands. 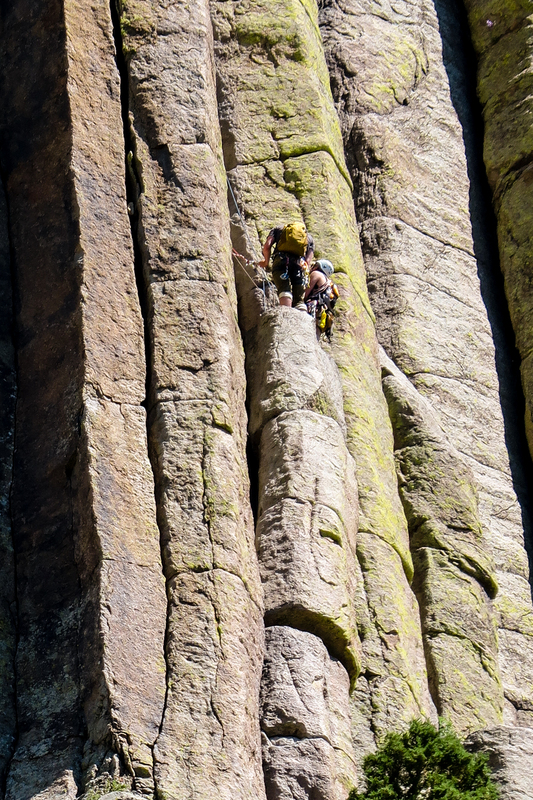 No adventurous thoughts from us, climbing was not an activity on our "to do" list! However, the National Park permits those that register. We delighted in the view of the valley from this vantage point. 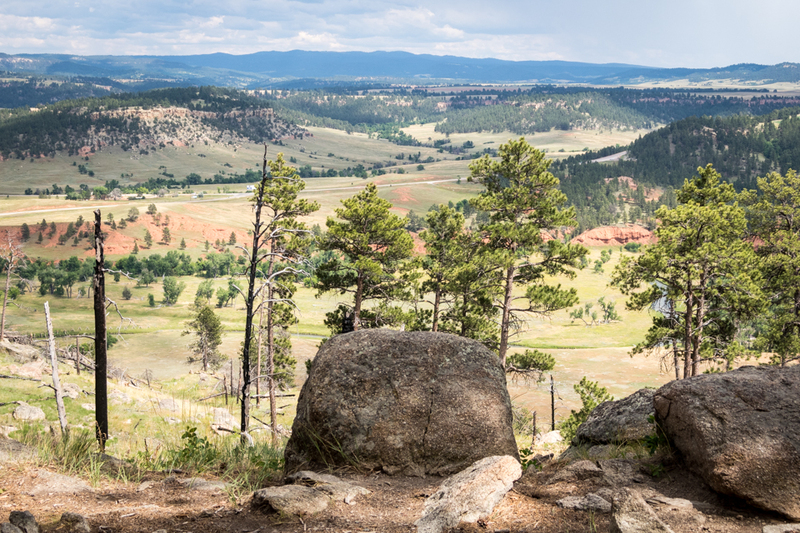 View of the Valley below Devils Tower. 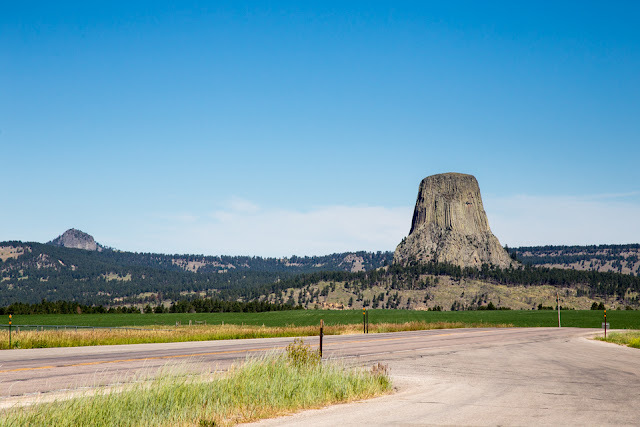 The climactic scenes of the 1977 classic “Close Encounters of the Third Kind” dramatized the natural wonder and made it a commanding visual image. Even for those who have never been can recognize a photo. Today the park sees about 500,000 visitors per year. Wildlife also frequent the area; we spotted a deer and many squirrels in the forested hills. Prairie dogs are plentiful along the base road. 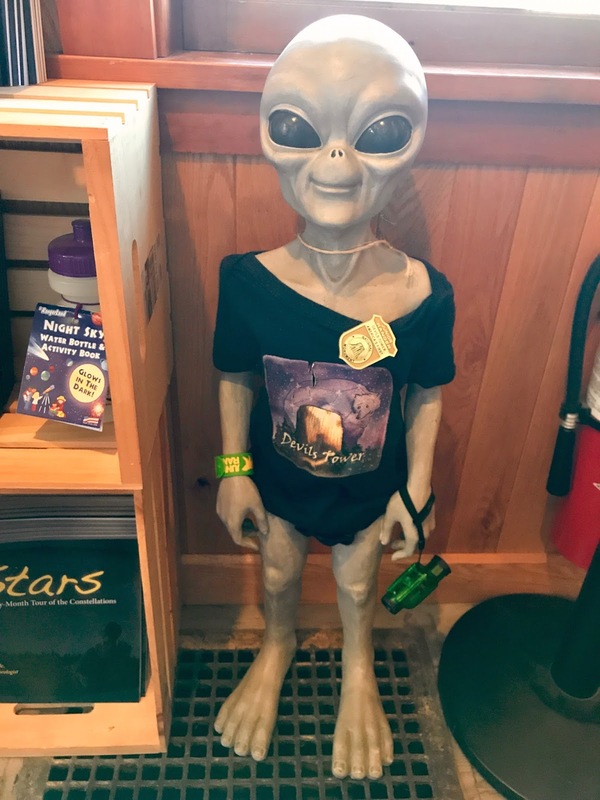 When we finished our loop, we naturally hit the gift shop. 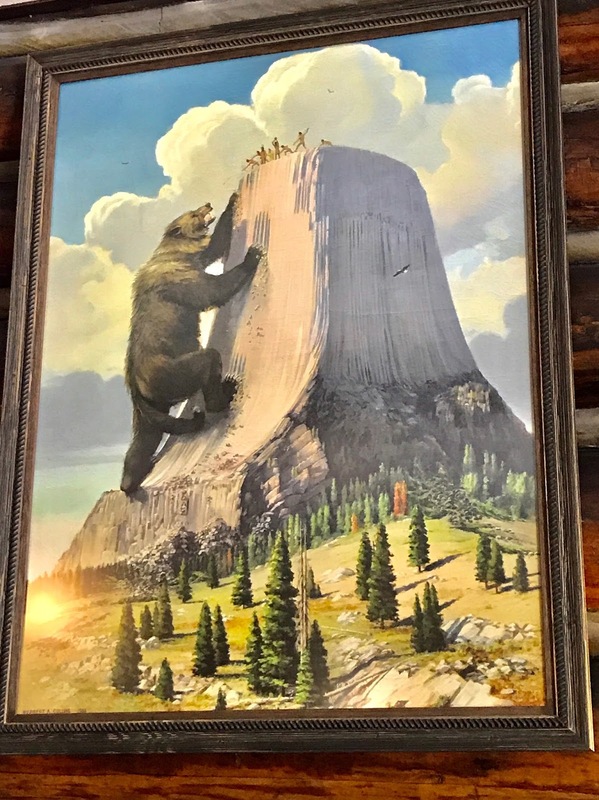 We found an endearing poster of the bear climbing the tower, and laughed at the little alien figure in a corner. 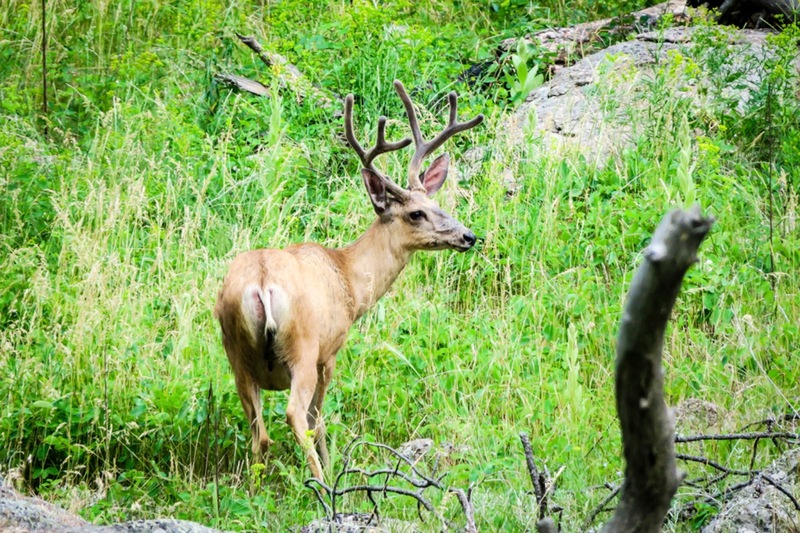 Deer as seen in the surrounding forest at Devils Tower. 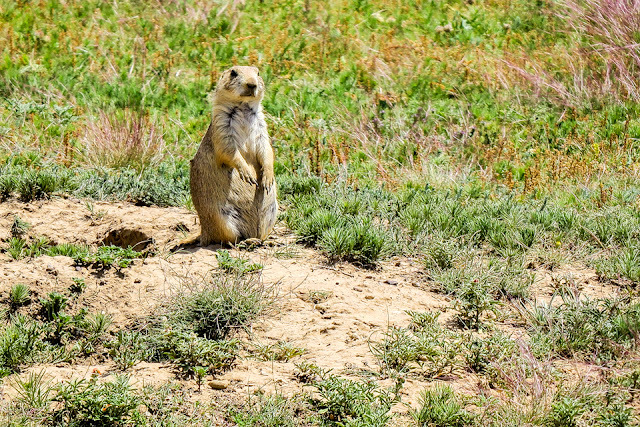 Oh those cute prairie dogs! Unless you feel like hiking more of the trails, you’ll only need about two hours maximum in the destination. No matter how it came to be, Devils Tower is an astounding geologic feature the likes of which I’d never seen before. 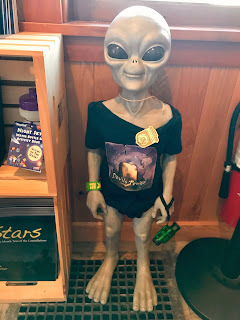 The movie was a great escape, but visiting in person was otherworldly. We had to stop for one more photo on our way out. When we left Wyoming for the 70-mile drive to Montana to see Little Bighorn Battlefield National Monument, site of Lt. Col. George Armstrong Custer's famed last stand, we had no idea it was the 141st anniversary of that battle, June 25, 1876. 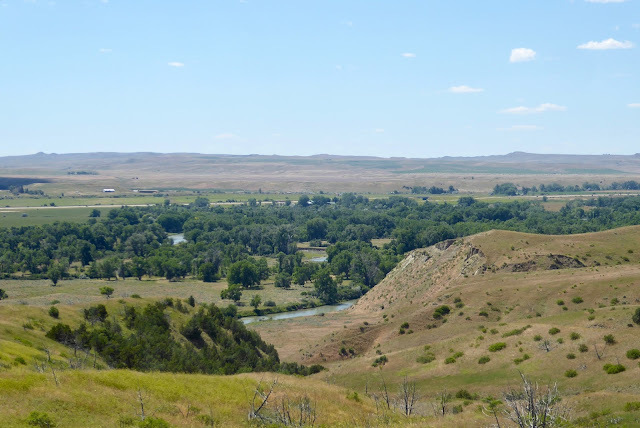 We lucked into a gathering of historians, interpreters and descendants of the Great Plains tribes - the Lakota, the Cheyenne and some Arapaho - that fought to preserve their nomadic way of life. 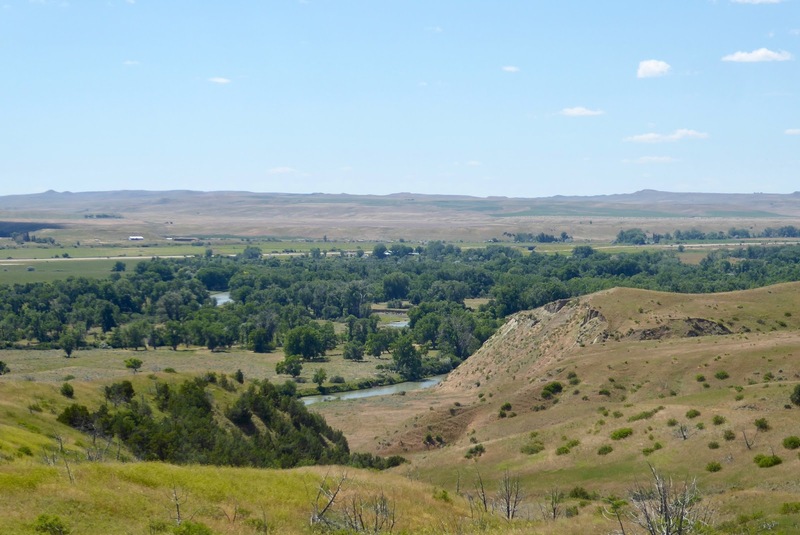 Life sustaining land for the Plains tribes. Photo © by Judy Wells. You can see why they didn't want to move. 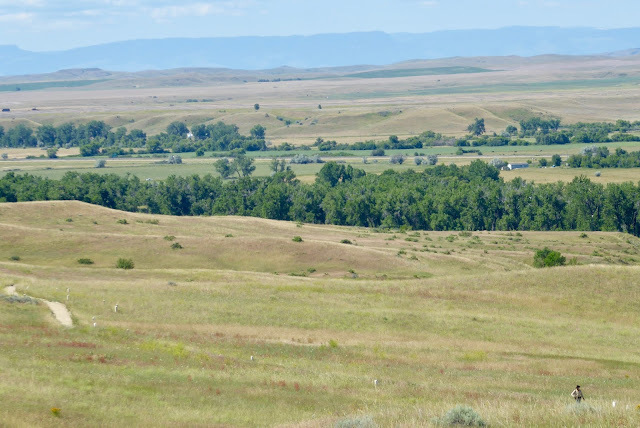 It's called steppe land, gently rolling hills of high grass that graduate from "steps" of mesa-like rises to foothills then mountains that were sacred to the people who lived on their flanks. Interspersed with creeks and rivers with treed banks, it is ideal for the herds of horses and buffalo that sustained the tribes. Like most interaction between the settlers and Native Americans, it is a sad story of promises made and broken. This had been designated by treaty Plains tribes' land but when gold was discovered in the Black Hills, the government decided to move the Plains peoples to another reservation. 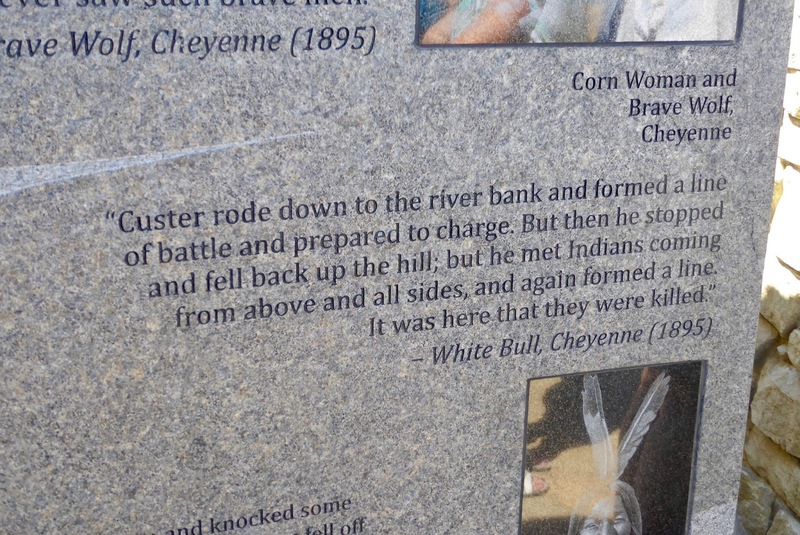 Despite having vowed to never raise his gun against a Cheyenne ever again, Custer entered the fray. National cemetery. Photo © by Judy Wells. Last Stand Hill. Photo © by Judy Wells. Photos © by Judy Wells. 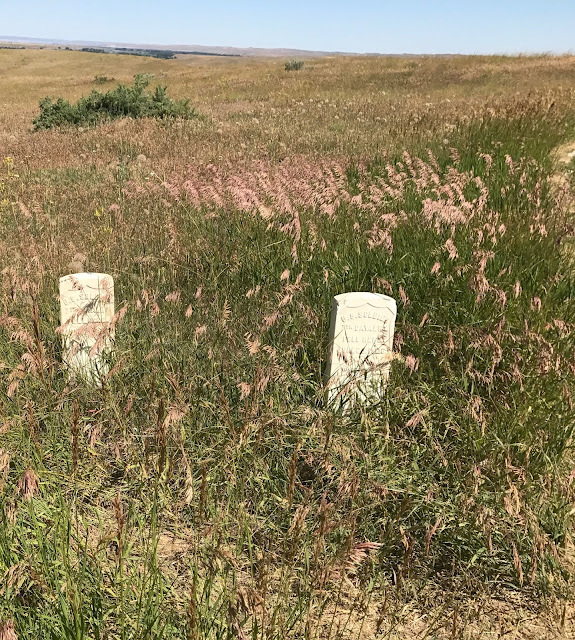 and headstones identifying where Custer's soldiers and the Indians were thought to have fallen and even one for the horse cemetery. They are guesstimates at best for the men - all bodies were removed after the battle - but nonetheless give visitors an idea of the action. A short distance from the hill is a circular earthwork, the monument to the Plains tribes. The "spirit door" welcomes the departed soldiers inside. The Native American version of Custer's death. Photo © y Judy Wells. Walls of the sacred circle display the names and words of those who fought and surround a sculpture of "spirit warriors." Spirit Warriors. Photo © by Judy Wells. 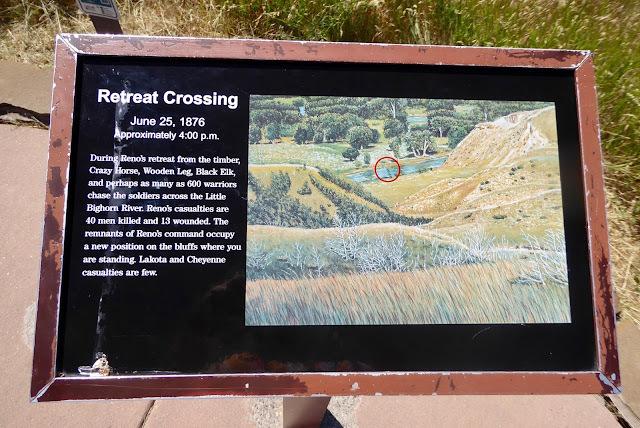 There is signage from the Visitors Center to Last Stand Hill and beyond to tell what happened where. Not that historians on either side agree beyond the fact that Tatanka-iyotanka "Sitting Bull," Crazy Horse and their warriors won the battle but lost the war. As word of the massacre spread, public opinion insisted the Indians must go. 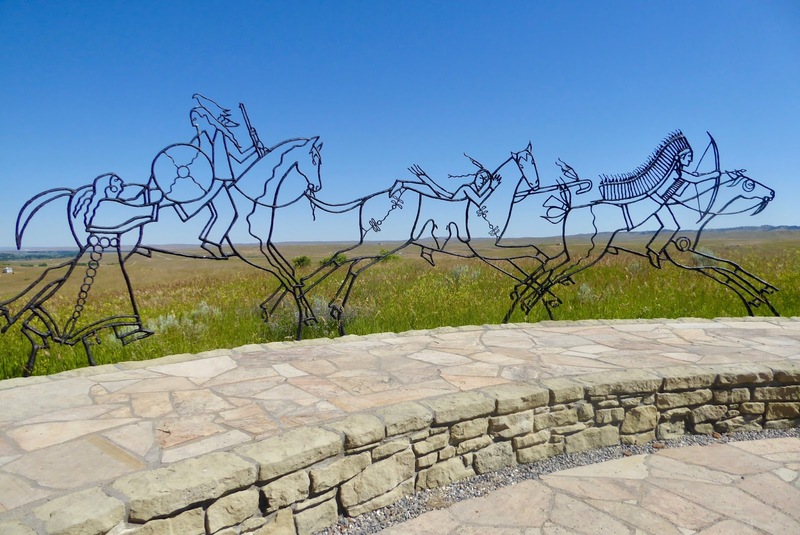 Within a few years they were all on a reservation and the Crows, who already had made peace with the U.S., were given the land surrounding the battlefield. 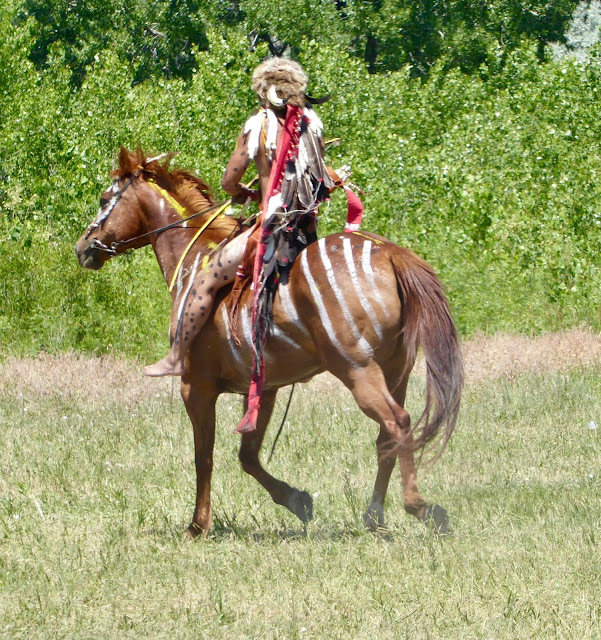 Re-enactor of Crazy Horse. Photo © by Judy Wells. 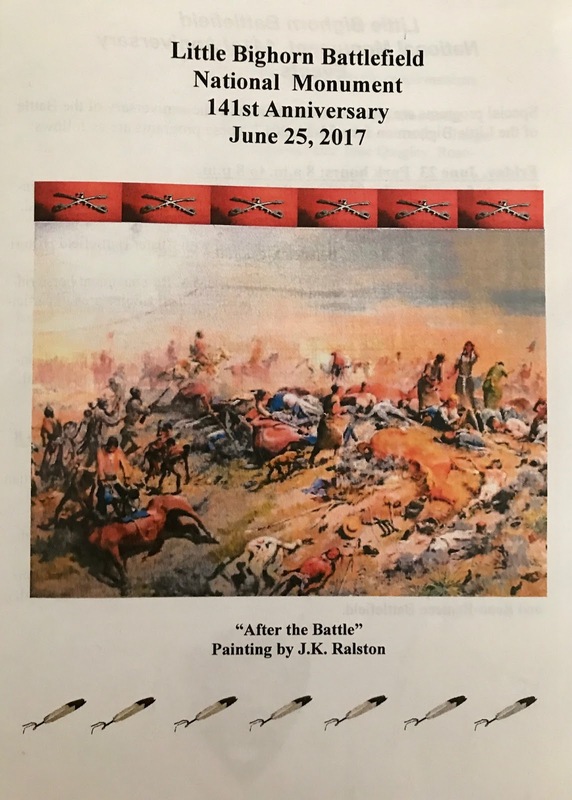 It was to Crow land we went next to see Real Bird's annual recreation of the battle, known to the his side as the Battle of Greasy Grass. It's held on Bird property along the Little Bighorn River where Sitting Bull's camp had been. For once the warriors are young Native Americans and the 7th Cavalry are white men who have learned the cavalry ways at the U.S. Cavalry School and have taken the three-day Custer's Last Ride. It was hot, just like on "that" day, but we were in bleachers and definitely not dressed in wool uniforms as the soldiers had been. We also had water bottles instead of canteens. Dusty like that day, too. Photo © by Judy Wells. 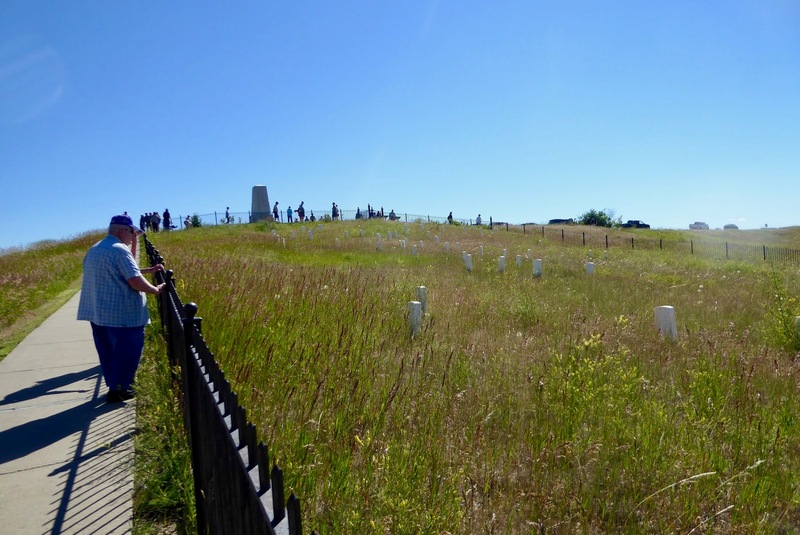 According to the narrator, Custer met his end here, not Last Stand Hill. After weeks of meditating and fasting, Sitting Bull had envisioned Custer at the battle, his death and a great victory. 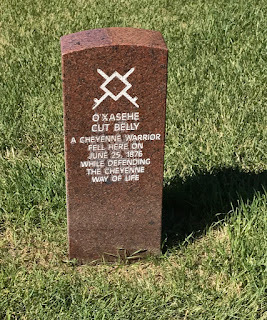 Tribal lore says the Lakota had recognized him from his long blond hair and captured and killed him long before battle's end. Interpreters and historians we spoke with at the battlefield insisted the Indians did not even know Custer was here until it was all over, nor would they have recognized him. The summer had been so hot he had cut off that long blond hair. 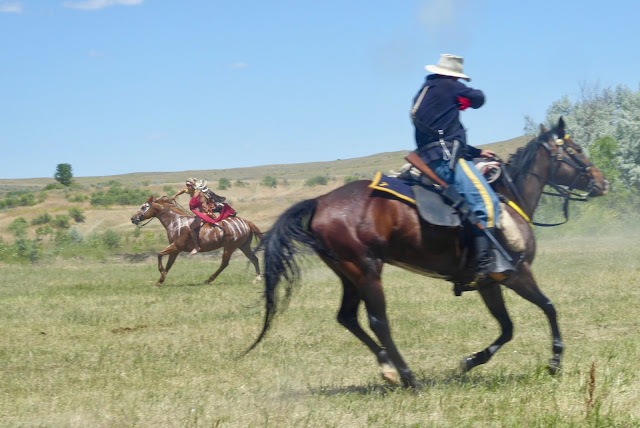 A member of the 7th cavalry takes aim a Crazy Horse. He missed. Photo © by Judy Wells. Whatever the truth may be, it was an afternoon of young riders in war paint whooping wildly back and forth on their war-painted ponies and bugle-blowing and formation keeping lines of cavalry. Quite colorful. 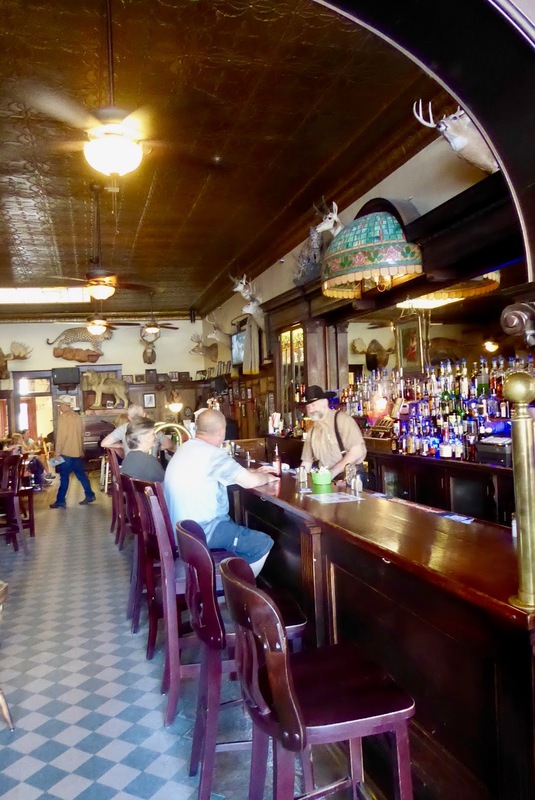 Battle weary ourselves, we headed back to Buffalo, Wyoming, for dinner in The Virginian at the historic Occcidental Hotel. 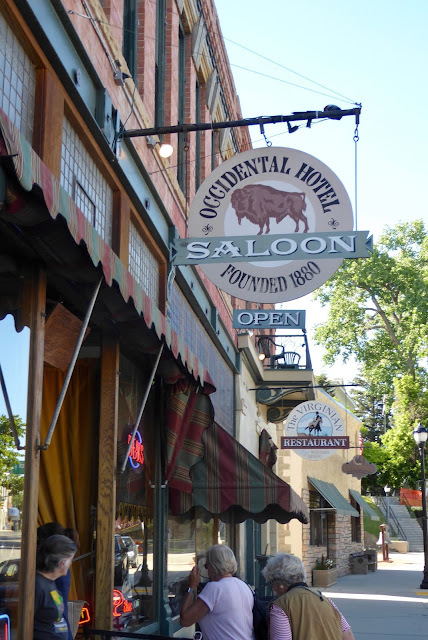 Built in 1880 for the railroad that went to Sheridan instead, the Occidental attracted many of the same visitors as well as Calamity Jane, Butch Cassidy and the Sundance Kid (who may have added to the bullet holes in the entryway and Saloon ceilings) and a host of hard-drinking sheriffs. The 18 rooms are named after some of them and the place reeks with wild west memories. 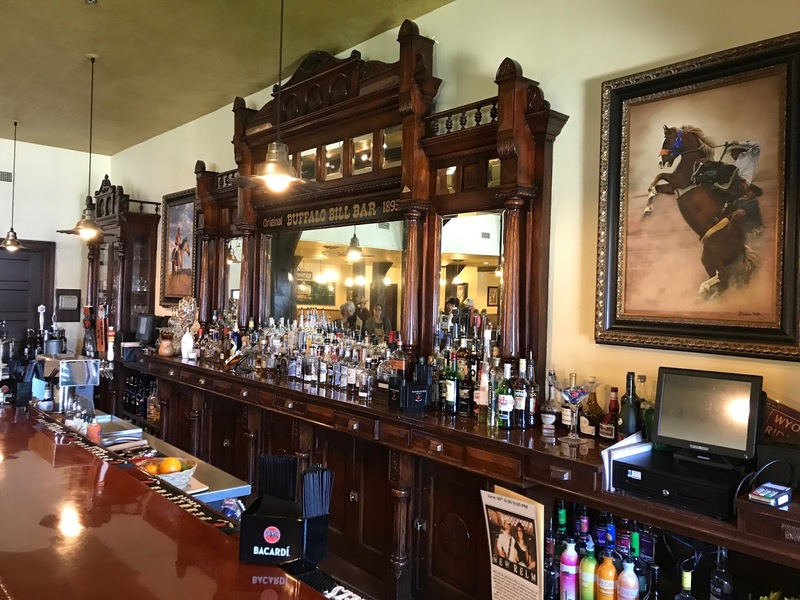 Someday we'd like to sip a few in that Saloon, lean back and listen to the stories of shootouts and high stakes poker games, during one of which ranchers, a father and son, won the hotel itself! Current owner David Stewart looked like he could tell a few. Occidental owner David Stewart. Photo © by Judy Wells. 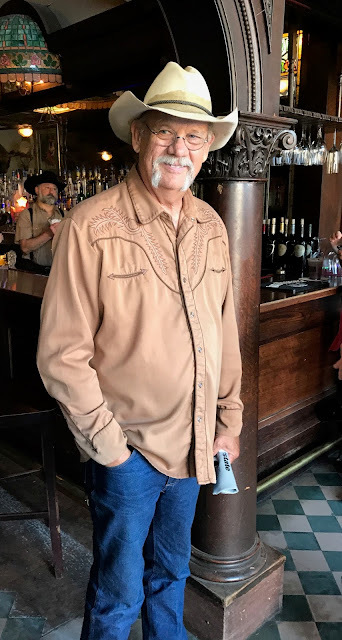 Fans of author Craig Johnson's Walt Longmire Mysteries series and the TV show based on them may recognize Buffalo as Durant in Absaroka County. There's even a Longmire election headquarters a few shops down from the hotel. Johnson follows Owen Wister whose The Virginian is largely based on tales and actions he witnessed during many stays at the Occidental. 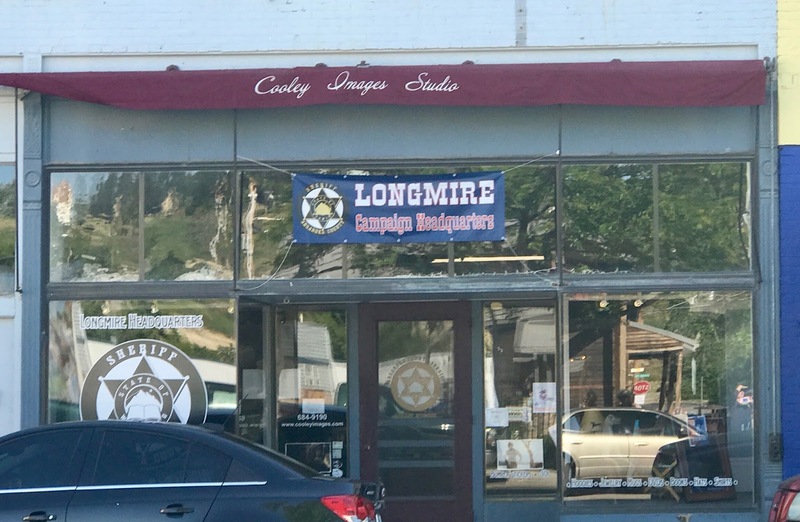 A real store for a fictional sheriff. Photo by Judy Wells. History and literature - a potent combination. The Brinton Museum nestles in the foothills of Montana's Bighorn Mountains. Photo © by Judy Wells. 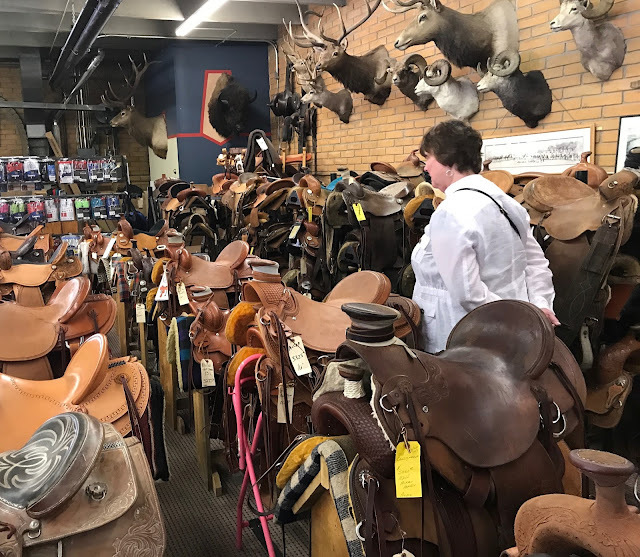 The city of Sheridan, population just 20,000, offers a wide variety of experiences. If you think the West uncultured, think again. 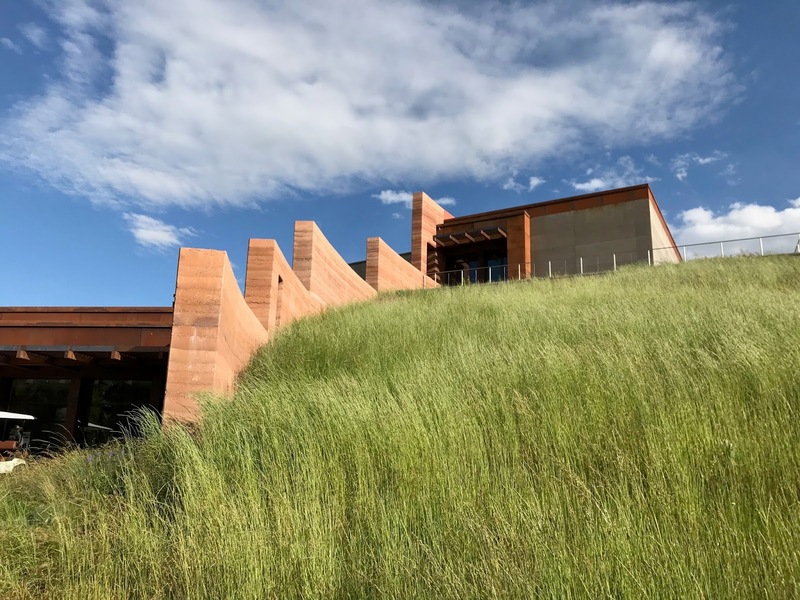 The Brinton Museum houses one of the finest western art museums in the world. In addition to paintings, photography and sculpture, it includes an outstanding collection of exquisitely designed leather craft. A rare Blackfeet Grizzly Shirt. Photo © by Judy Wells. The Chinese used the rammed earth technique to build the Great Wall of China and so did the trustees of the Brinton Museum when they enlarged the facility with the Forrest E. Mars Building (the candy company family are Brinton supporters). 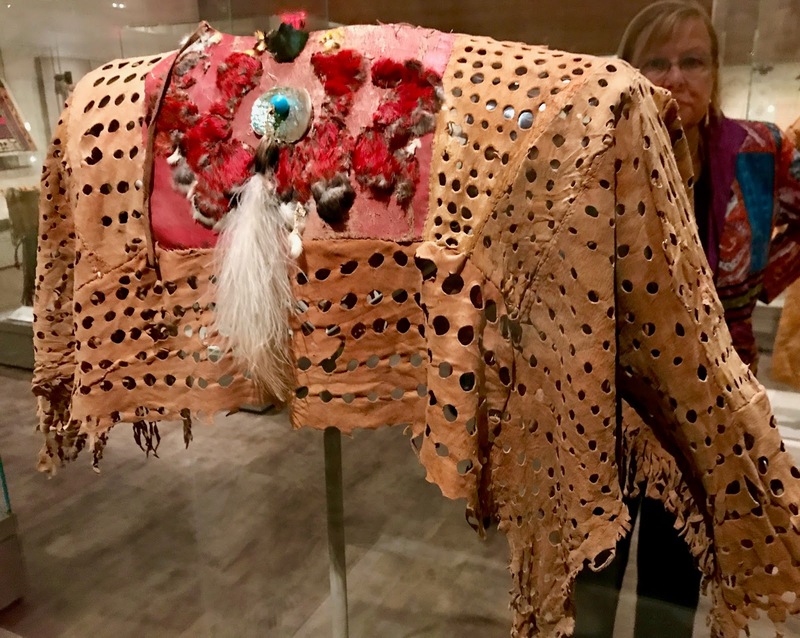 Like the wall, the building and its 19th-21st century Western art and Native American collection should be safe for several more millennia. 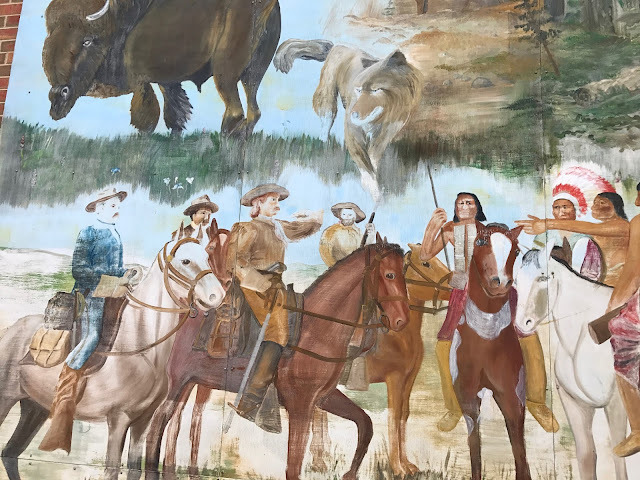 Bradford Brinton and his older sister Helen may have been from Illinois but they fell in love with the west, she with Arizona, he with Montana and both with Western and Native American art and artists. 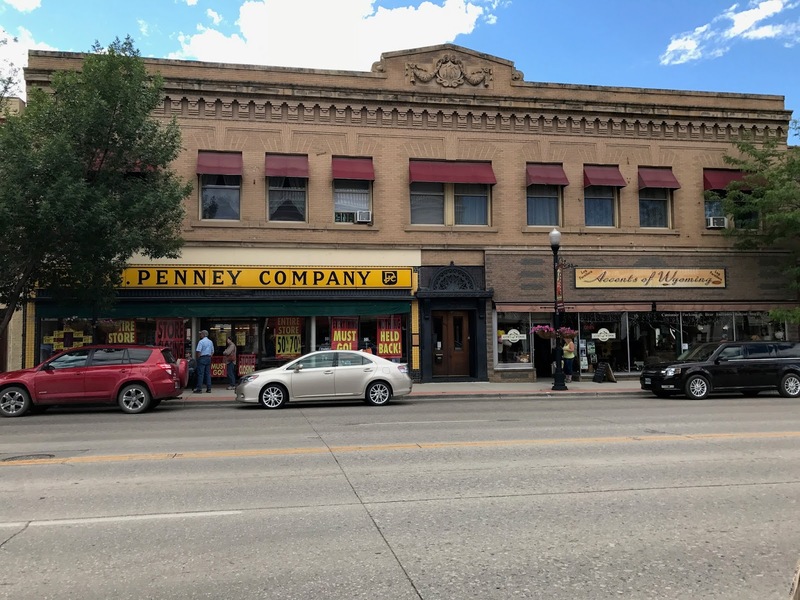 Wealthy from developing the family's farm equipment company, Brinton bought the historic Quarter Circle A Ranch. When he died, he left it to his sister, knowing she would never sell it. The "Whoopie Cabin." Photo © by Judy Wells. 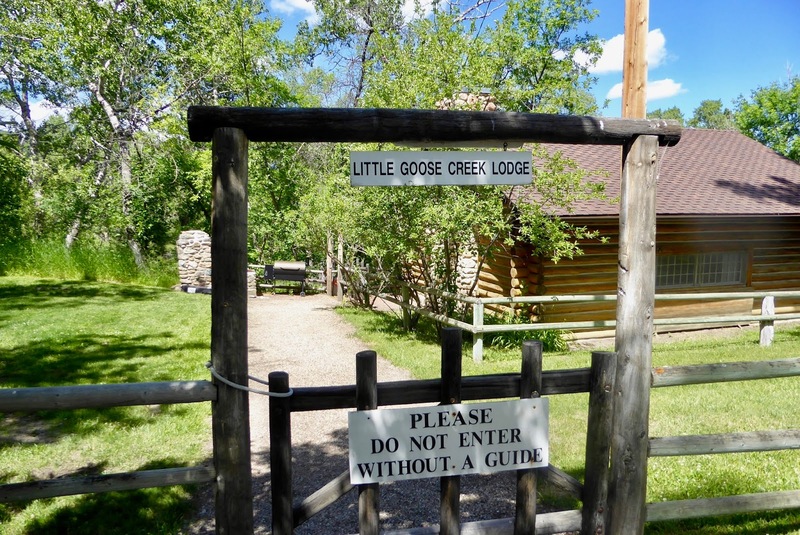 May through September via tours as is the Little Goose Creek Lodge, known to his friends as the "whoopie cabin." Jim Jackson shows a group how he creates his leather work. Photo © by Judy Wells. 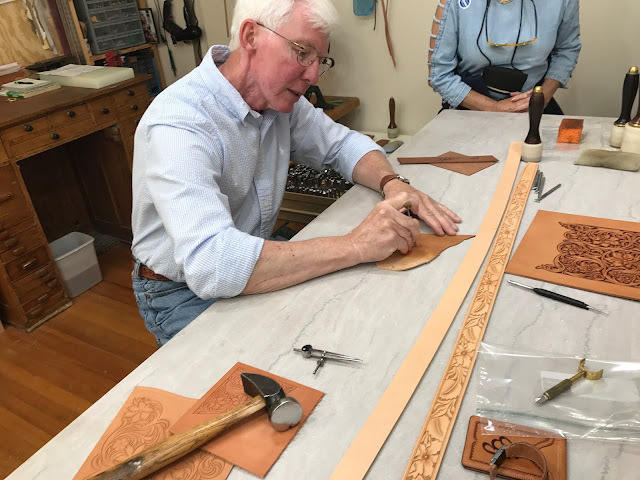 One area is being used as a studio for artists in residence like James F. Jackson, who grew up in his father's saddle shop and now displays and explains his craft to visitors. Downtown Sheridan. Photo © by Judy Wells. Sheridan’s downtown looks as I expected the Old West: wide streets, from the days when horse-drawn wagons needed space to turn around, and many original brick buildings. 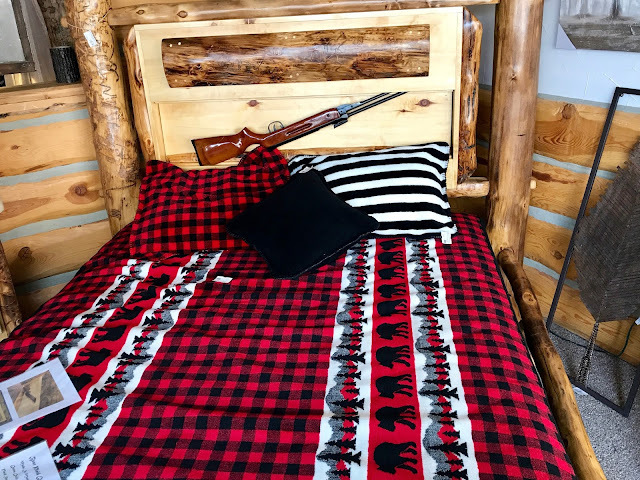 A walking tour took me past City Hall, a stone courthouse, a shoe store featuring hundreds of colorful cowboy boots, and a furniture store selling a bed with a hidden compartment for a rifle. Looks like a plain bed. Photo © by Judy Wells. 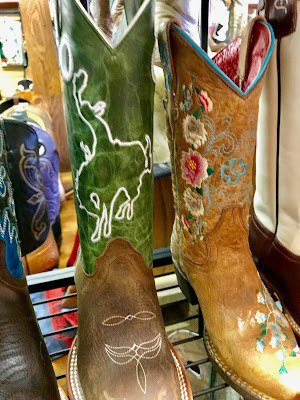 Of course we had to examine the boots and see that bed demonstrated. But with a one-of-a-kind key... Photo © by Judy Wells. ... we had to go in and meet Henry. And yes, given the chance he will follow you home. 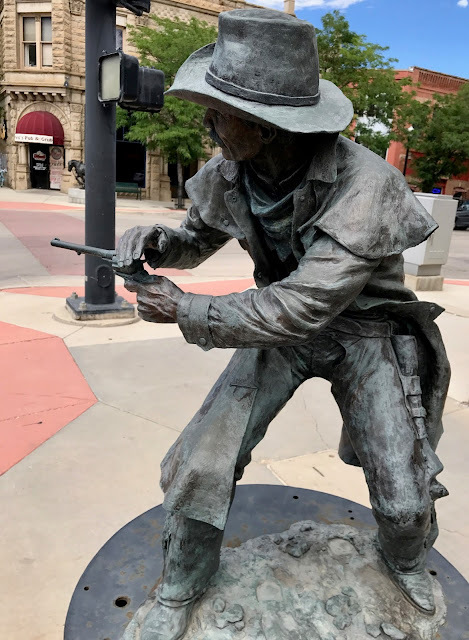 Like many enlightened down towns, Sheridan's is enlivened with western themed sculpture and murals. Do like this growing trend. The Good Girls, Judy and Debi. Everyone ends up at the famous Mint Bar, a 1907 saloon redecorated in the 1940’s. 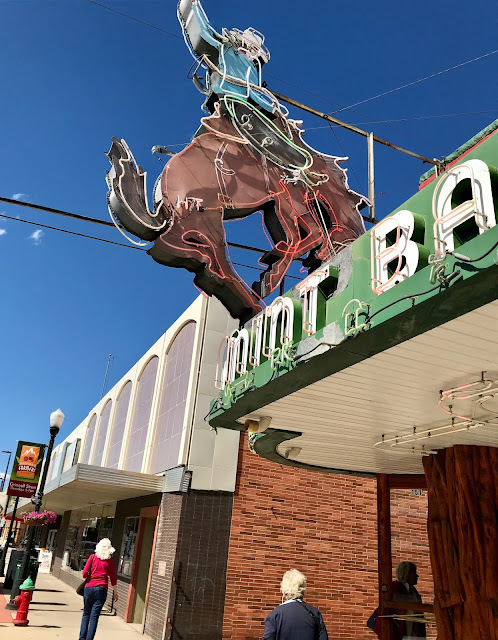 The Mint’s vintage neon exterior sign attracts thirsty mouthed patrons from all walks of society. Walk in and sit down; you’ll find game mounts (stuffed animal heads and/or full bodies) and lots of old photos along the walls. You can’t miss the set of horns measuring seven feet from tip to tip centered behind the bar. Nor can you miss the skin of a rattlesnake that was just a tad bit longer mounted above those horns. 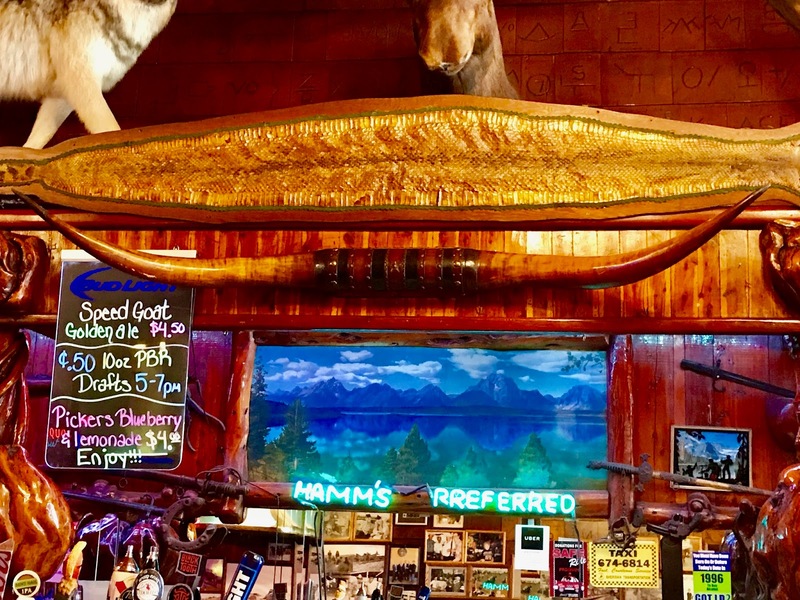 The beer is cold, too. Judy's favorite stop. Photo © by Judy Wells. 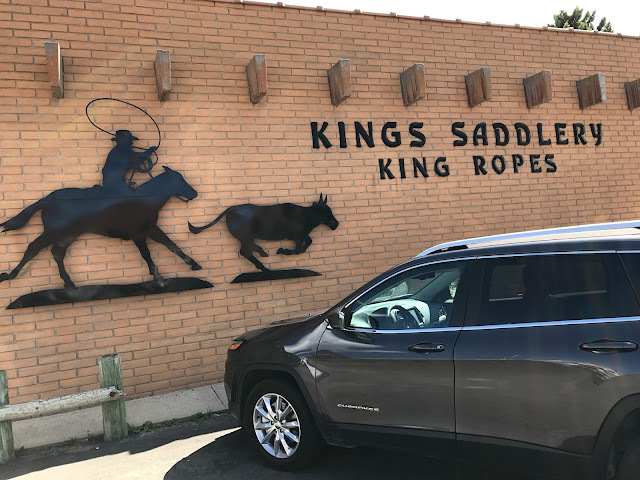 One not-to-be-missed stop downtown is the famous King Saddlery, King Ropes. Never heard of it? Just ask a competition calf roper. His or her best ropes probably began life there. 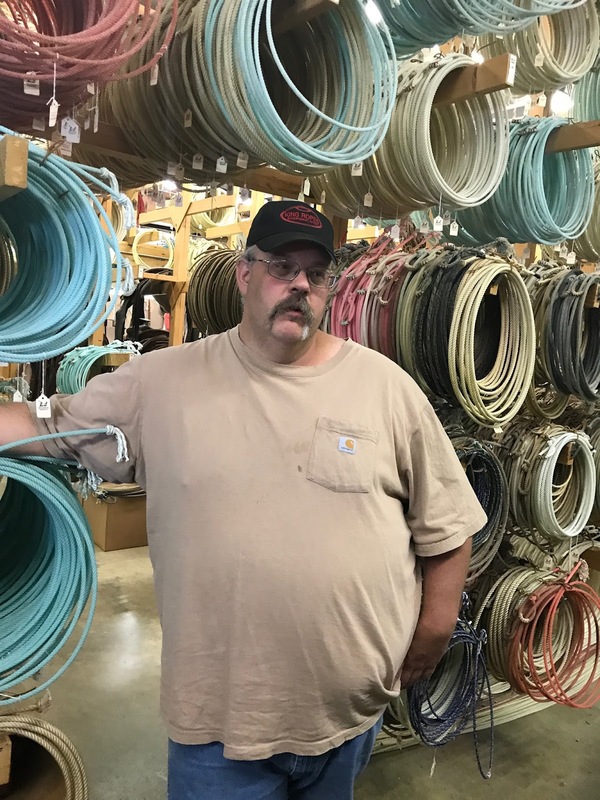 Mike Wooton, rope technician. Photo © by Judy Wells. 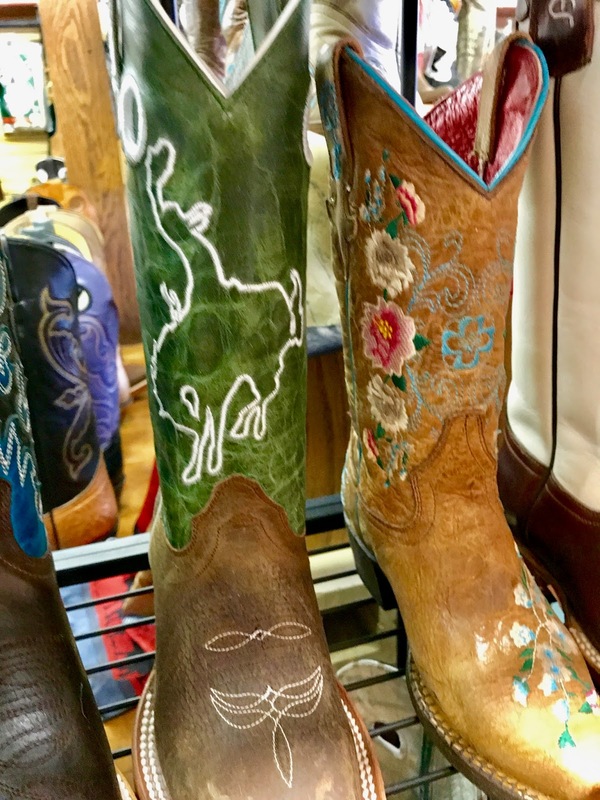 Their saddle may hail from there, too. 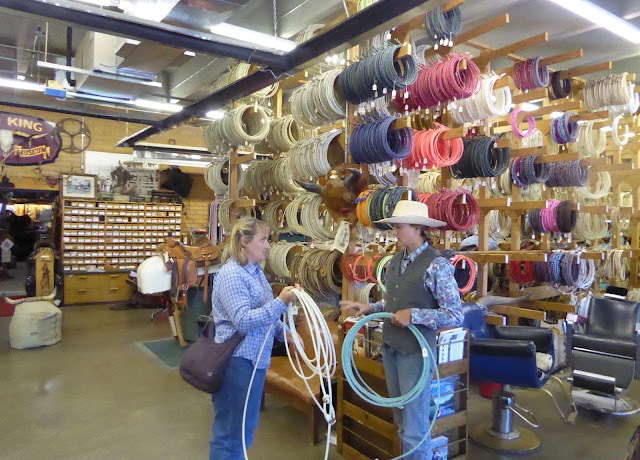 Its block-deep building contains everything for the Western aficionado, from boots and chaps to hat and hat band, horse tack and medications and every weight, color and texture of rope, left and right handed (! ), from an inventory of more than 30,000. 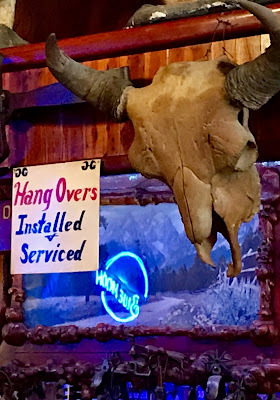 Home decor, too. As if that weren't enough, Don King Museum with its collection of historic saddles, bridles, weaponry, wagons, carriages and artifacts is a must-see. 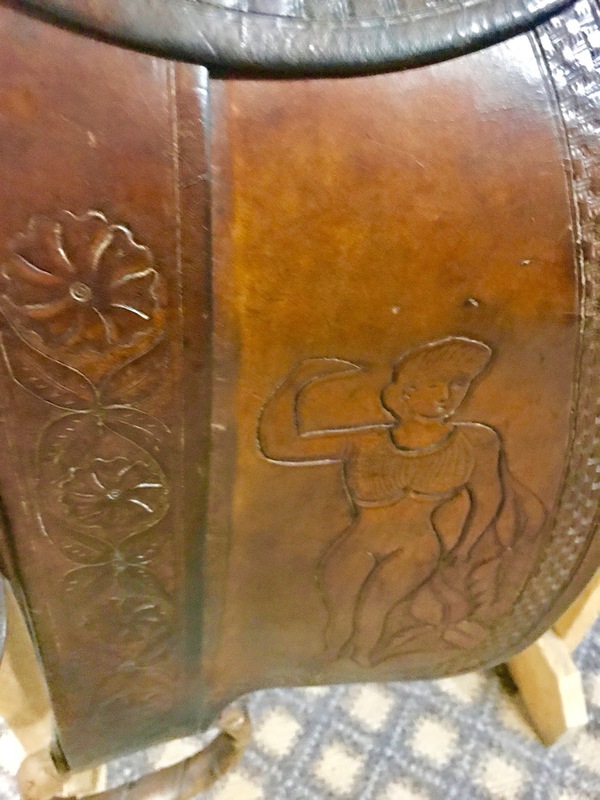 I ask you, where else will you find an old saddle with flowers carved into the stirrup leathers and a naked woman etched into the fenders? The historic Sheridan Inn. Photo © by Judy Wells. 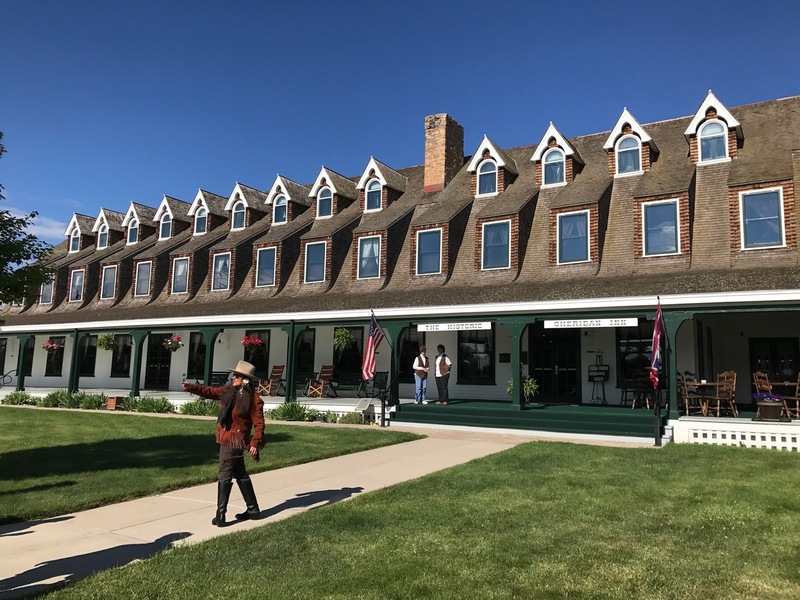 The Sheridan Inn, part of the Historic Hotels of America, was the place where Buffalo Bill Cody held auditions for his traveling show. Its saloon maintains Buffalo Bill’s wooden bar given to him by Queen Victoria. One of two bars Queen Victoria had made for Bill Cody's hotels. Photo © by Judy Wells. 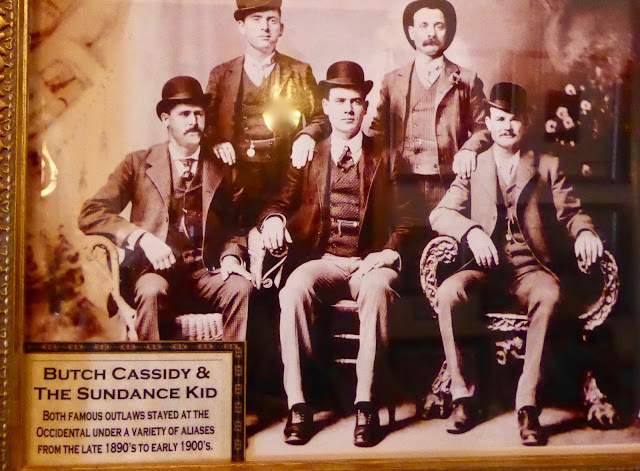 Cody was a co-owner of the circa 1893 hotel, once considered the finest between Chicago and San Francisco, having talked the railroad into building it. Queen Victoria was so amused by his wild west show she had two front and back bars made for his hotels; the second is in the Irma Hotel in Cody, Wyoming. 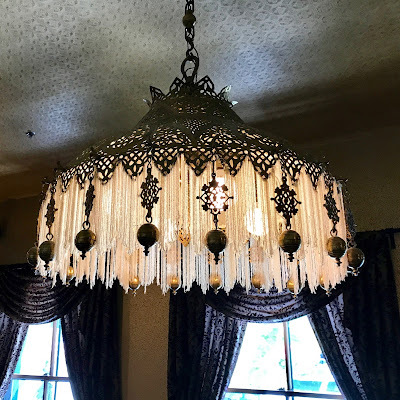 The copper and pearl chandelier in the Ladies' Parlor. Photo © by Judy Wells. 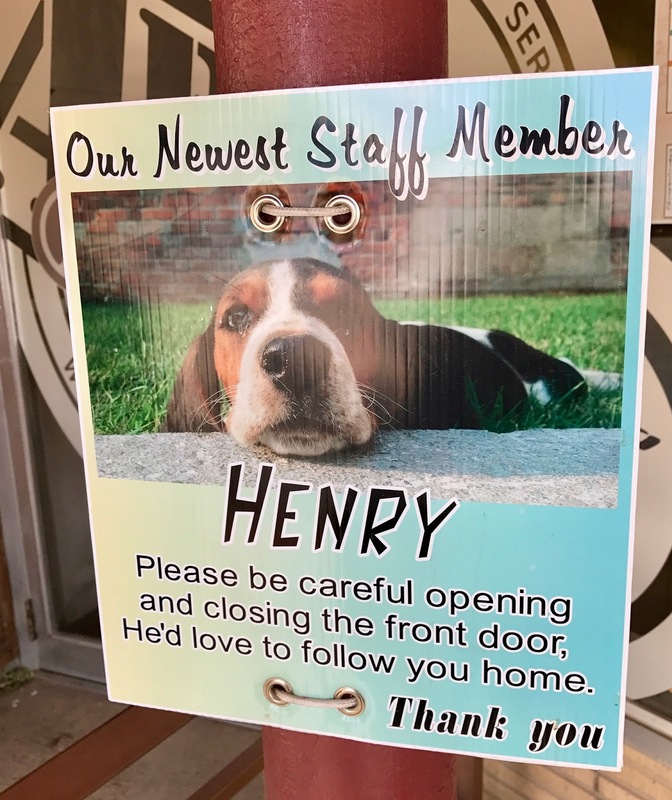 The current owner used to play on the front porch while his mother worked at the hotel and has lovingly restored the historic edifice. 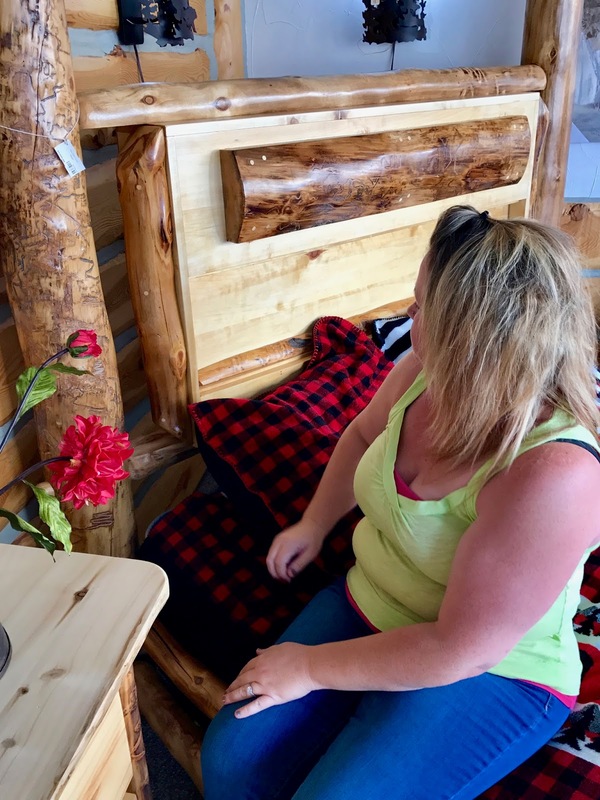 The 22 rooms, named for Cody and the 21 people who were most important to him, have been tastefully updated and the public areas have been returned to their glory days. The pearl and copper chandelier in the Ladies' Parlor glistens and the registration desk in the Gentleman's Parlor looks much as it must have 100 years ago. Stepping through the front doors is like entering a time capsule, albeit one with Wi-Fi. Trail End. Photo © by Judy Wells. Trail End is a historic home to visit with a remarkable Horatio Alger-ish tale. 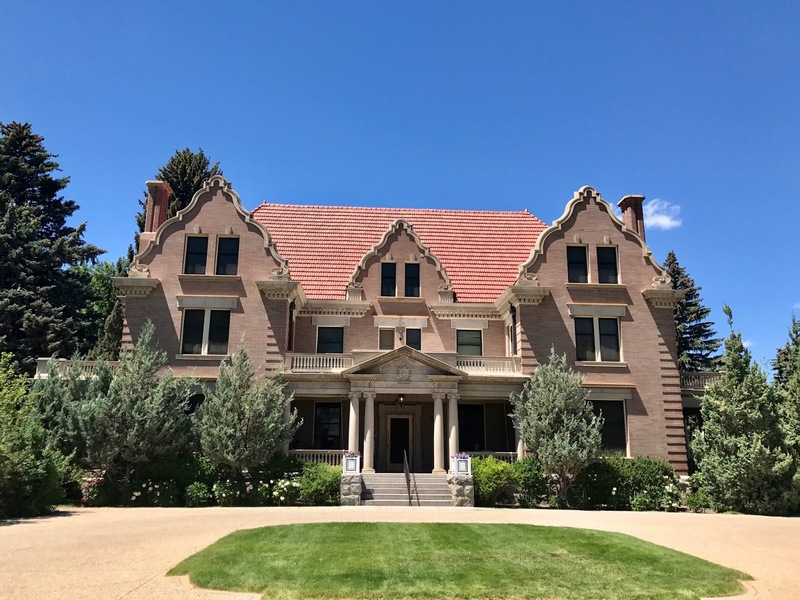 It was built by John B. Kendricks, once a penniless Texas orphan who had made his way into the Wyoming Territory by the age of 21. He signed on as a trail rider on a cattle drive and at the age of 34 in 1891 married the boss's daughter. Over the next 18 years he amassed a cattle and land empire with 10 ranches across 210,000 acres in two states. Shortly after building Trail End, the only known example of Dutch revival architecture in Wyoming, Kendricks first was elected governor and then U. S. senator for the state. 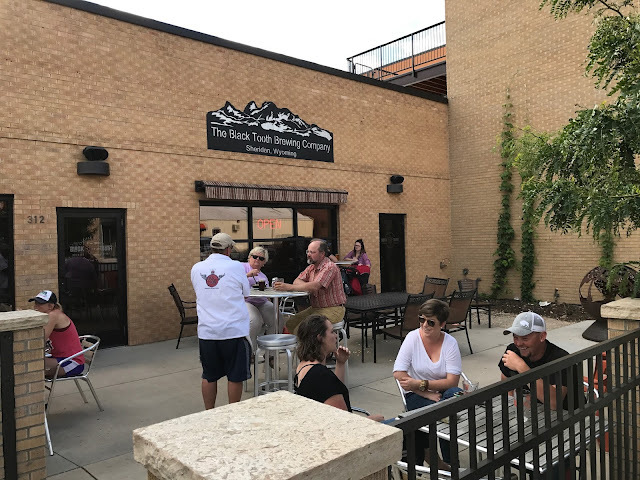 The young crowd gathers inside and out at The Black Tooth Brewery. Photo © by Judy Wells. Sheridan is not just a historic site. In keeping with the times, the Koltiska Distillery and Black Tooth Brewery add to today’s craft scene and a vibrant nightlife. 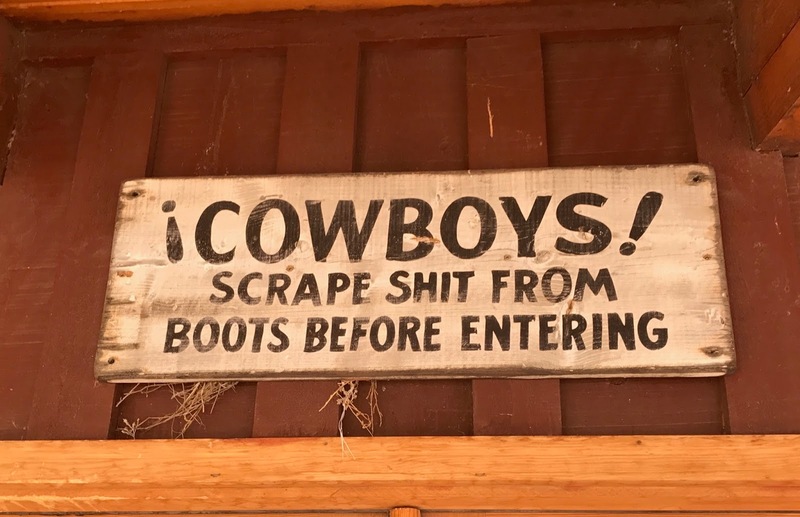 It's a real Western town, too. Those aren't drugstore cowboys or all hat no horse cowgirls you see at King's. 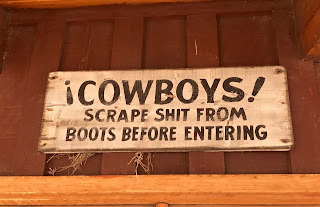 That's a lifetime of trail dust, horse and cow poop on or just wiped off their boots.